Thank you to Julian for sending this postcard of Double Fairlie “Merddin Emrys”. Julian spent some of his summer holiday as a volunteer working on the Ffestiniog Railway, a narrow gauge heritage railway in Gwynedd, North Wales. The line was built between 1833 and 1836 in order to transport slate from the quarries of Blaenau to the coast at Porthmadog where it was exported for sale as a roofing material. Slate is a metamorphic rock which can be spilt into thin sheets, it is non porous and this makes it ideal for roofing, especially in places with a lot of rain. 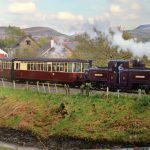 The Ffestiniog Railway is used more for tourism now rather than the slate industry. The slate industry in Wales is still working but much declined compared to the glory days of the railway. Julian suggested that Geography Cat should research the recent technological breakthroughs that make the most of Welsh slate. However, Geography Cat’s research became wrapped up in knots as quickly as any other cat playing with a ball of wool. When you see this please get in touch and point us in the right direction Julian.